I can rarely resist a book, especially a book about history. 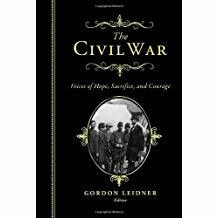 Recently I found an interesting little volume — The Civil War: Voices of Hope, Sacrifice, and Courage, edited by Gordon Leidner. It lists over 220 quotes from soldiers and civilians on both sides, as well as texts and excerpts from some of the war’s most memorable speeches. Here are some quotes that I thought were especially descriptive, particularly in these divisive political times.